Sorry for the delay. Busy weekend of doing nothing. The sandwich: Bacon Cheeseburger from Double Windsor, 16th St. and Prospect Park West, Brooklyn. The construction: Ground Pat LaFrieda beef with American cheese, bacon, lettuce, tomato, pickles and onions, cooked medium rare. The standard burger at Double Windsor comes with neither bacon nor cheese, but they’re both available as add-ons. They also offered cheddar and blue cheese. Important background information: I pretty much always want a cheeseburger. Unless I’m absolutely stuffed to the point of feeling disgusting, there’s just no situation wherein someone might offer me a cheeseburger and I would reject it. If I were wearing a white suit in the car on my way to Puff Daddy’s White Party and you were like, “hey, I got you this Big Mac but they went a little crazy with the Special Sauce,” I’d probably still eat it and show up with a big grease stain on my pants and embarrass myself in front of Tila Tequila and Nick Cannon. In my mind, there are four primary categories of burger: There’s the basic fast-food burger, the upscale fast-food burger, the pub burger, and the fancy burger. Though typically the upscale fast-food burger (a la Five Guys, Shake Shack) are better than the basic fast-food burger (McDonald’s, Wendy’s), there’s a great variance in quality of burgers in each category. The upscale fast-food and fancy burgers probably see the greatest variety of toppings on average, but sometimes a pub will surprise you with some Canadian bacon or something. Every category of burger has its place, and every category offers some great burgers. Before she was my wife, my wife used to judge me for frequently ordering burgers at restaurants that weren’t specifically burger places. To me, though, the burger is the best standard by which to judge a restaurant. The floor for burgers is so high that if the burger is only OK, the place is probably just so-so and I didn’t want any of that other stuff anyway. If the burger’s outstanding, I’ll return and eye something else on the menu, only to ultimately just order a burger again because the burger was so good and how can you go wrong with a burger? How it tastes: Excellent. The bacon cheeseburger at Double Windsor is about as good as you can reasonably hope for a pub-style burger to be. The meat’s so juicy, burger-juice pours out of the back of the thing like a faucet while you’re eating it and covers your mixed-green salad with a delicious burger-juice dressing. And though it’s not a massive burger, the meat is thick enough to keep the portions correct; the beef in no way gets drowned out by the toppings. The toppings are great too. I got American cheese because I was in the mood for the burgeriest burger, and American seems like the de facto burger cheese. I typically order cheddar, but partly because I know I might get judged ordering American cheese. Time to break those shackles: American cheese is delicious. It melts better than every other cheese (because of an emulsifying salt that prevents the oil from separating under heat), and it’s creamy and salty and cheesy and great. You’re not better than anyone; stop hating on American cheese and admit that some of this country’s mass-produced staples can be pretty damn delicious in the right use. The bacon is bacon, and there’s a lot of it. It’s good, flavorful stuff, too. One slice was cooked a little less crispy than I might prefer, but that’s nitpicking. Plus, the other slice provided plenty of crunch for the sandwich. The bun tastes sweet and fresh and mostly holds the burger together — though it withered under the grease after a while. Lettuce, tomato, pickles, onions: All good, all perfectly proportioned. One slice of lettuce for some crunch, one bun-sized piece of tomato for sweetness and moisture, a few small pickles and a small handful of diced onions for flavor. I ate this burger immediately after playing nine innings of baseball under an unrelenting sun on the hottest day in weeks. It was exactly what I was looking for: A big, juicy, satisfying burger to eat during a spirited postgame brodown. When I was done, I wanted another. So it goes. What it’s worth: My primary gripe is the price. The burger alone costs $12, but since the cheese and bacon cost extra the whole thing costs over $16 with tax. Everything’s delicious so you’re paying for what you get, but that’s a lot for any burger. The rating: 85 out of 100. Five dollars cheaper and we’d be talking about the Hall of Fame. I was in Ithaca last weekend for a wedding. I saw some gorges because I knew about them because of that t-shirt. I looked for a t-shirt that says, “Ithaca is Borges” but I couldn’t find one. The sandwich: The Sui hot-truck sub from Shortstop Deli in Ithaca, N.Y. The construction: Pizza sauce, mozzarella cheese, pepperoni, ground sausage and mushrooms on toasted garlic bread. I ordered mine with extra crushed red pepper. Important background information: The Shortstop Deli is owned by the same people who own “The Hot Truck,” a popular mobile restaurant on the Cornell University campus. I’m not familiar with the full history of the thing, but supposedly the original owner realized the best way to cut costs was selling what he called “Poor Man’s Pizzas” — pizza ingredients on french bread sandwiches. Purportedly, the guy who brought french-bread pizza to Stouffer’s was a Cornell alumnus trying to imitate the Hot Truck. The Shortstop Deli is always open. It hasn’t closed since it opened in 1978. I suspect to college students that’s about the best thing ever. Also, as an added bonus, their menu is baseball-themed. My wife and I split a “double” sized Sui, though I probably could have been talked into a home run. How it tastes: Oddly comforting. Actually, it tastes a hell of a lot like if you took the two best french-bread pizzas you could find and smashed them together into a sandwich. It feels like something I’d want to accompany some homework, but not really college homework. Middle-school homework; the time when you craved and appreciated and frequently enjoyed french-bread pizzas. The best part is the bread. Baked locally at Ithaca Bakery, it’s way softer on the outside than most french bread you’ll find, so it toasts to only a mild crustiness. The inside stays soft and soaks up a lot of the sauce and greases, so basically you’ve just got the crust to shield your hands from all the pizza stuff and add a touch of crunch. In that way, it’s a lot like eating a folded slice of New York pizza, only a bit more substantial. The meats add meat, primarily, and peppery flavor on top of that. They combine with the red pepper here to give the sandwich at least three slightly different flavors of peppery heat, which is nice. It’s hard to distinguish ingredient from ingredient when you’re tearing into the things, and the mushrooms seem like they serve as sponges for soaking up and delivering sauce more than anything else. That’s fine because I don’t much care for mushrooms. The cheese stretches off the sandwich to your mouth as you bite it — again, like pizza. Melted mozzarella, as you probably know, is delicious and provides a chewy consistency that’s key to giving this sandwich some interesting texture. It’s greasy as anything, and I suspect it would be unbelievably delicious while drunk and hungry in the middle of the night. It was very delicious while stone-cold sober at about 3 p.m., too. What it’s worth: Maybe the most impressive part — the double, which provided a reasonable but not big meal for two people, cost $7.25. A single, stripped-down version of the sandwich (with no meat) costs only $3.95. It’s good to get away from Manhattan sometimes. How it rates: 84 out of 100. I’m not sure I’ve ever had a duck sandwich before. Turducken yes, straight-up duck no. The sandwich: Chubby Chinese Girl from Certe, 55th between 5th and 6th in Manhattan. The construction: Chunks of duck on a toasted baguette with cilantro, strips of cucumber and carrot, pickled radishes, lettuce, chili sauce and hoison sauce. Important background information: Certe is very close to my office and offers a large variety of tasty-looking sandwiches, including monthly and daily specials. I had never found it until I Googled “best sandwich in Midtown Manhattan” on a whim earlier this week. The Chubby Chinese Girl is only available on Thursdays. Certe’s menu boasts, “We don’t just sell food. We sell certainty.” If only! What I wouldn’t pay for certainty in this capricious world. How it tastes: Tasty. It tastes primarily like the mix of hoison and chili sauces, but it so happens that’s a nice blend of sweetness and spiciness with flavors that go together well. And the vegetables, including the pickled radish, give it some of the flavors and textures of a typical banh mi. The duck is a tiny bit disappointing. I got the sandwich because I was intrigued by the idea of a sandwich with duck meat. At its best, duck can be more moist, more flavorful and more fatty than more common poultry, and outside of its price it seems ripe for sandwiching. What is Peking duck but a Far Eastern cousin of the sandwich (or the soft taco) — when right, delicious duck with sweet sauce wrapped in a starch. But here, the duck was a little dry and chewy. It worked fine as a meat to add muscle to the sandwich, but it didn’t bring anything particularly special to the item. The baguette, toasted, was pretty hearty and very crusty, the type of bread I’d certainly love under butter. But it was sort of a chore to chew, so combined with the duck it made eating this sandwich a good workout for the jaw. Again: Still a very good sandwich. These quibbles come from the distinction between my sky-high hopes and the only building-high reality of the thing. What it’s worth: The Chubby Chinese Girl costs $8.95, pretty much the baseline rate for any non-street-meat lunch in Midtown. I’ve paid well more for way worse sandwiches in the neighborhood. How it rates: 70 out of 100. 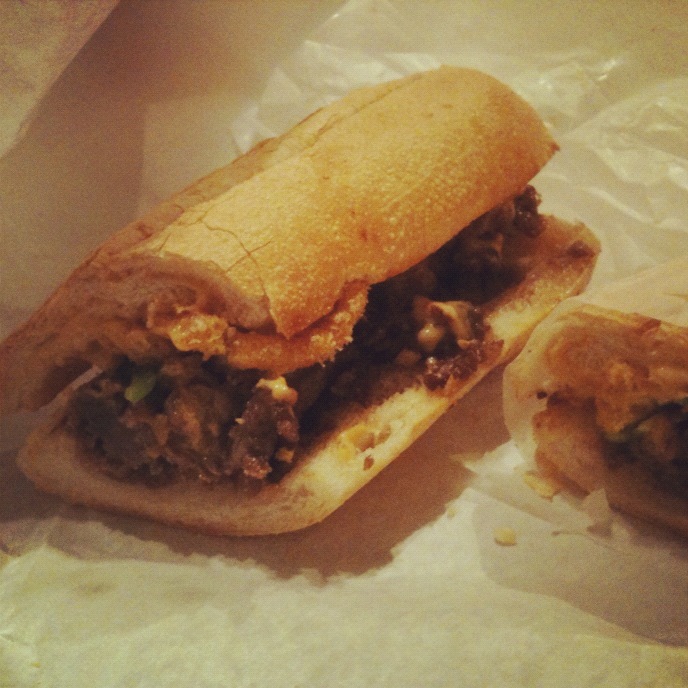 The sandwich: The 50/50 from Jake’s Sandwich Board on South 12th St. in Philly, recommended by Twitter multiple times over. The construction: Slow-roasted pulled pork, bacon, house sriracha spread and provolone cheese on a sesame-seed hoagie. Important background information: Jake’s sandwich board features a slew of awesome-sounding sandwiches. I picked the 50/50 because of a sign near the front calling it the Sandwich of the Year in some newspaper or magazine’s poll, and because the two guys ahead of me on line both also ordered 50/50s so it seemed like the thing to get. When I sat down to await my sandwich, the guys at the next table over were in the midst of a discussion of Jake’s wall of fame and shame. “I don’t see him on here,” one guy said. “Well, his doctor told him he had to stop,” said another. How it tastes: Decadent. Delicious, but spectacularly decadent. The pulled pork is so tender it hardly gives when you bite it, allowing your jaw to tear through a whole lot of pork in very little time. The meat itself has a pleasant pork flavor with a soft, black-peppery kick, which combines with the “house sriracha spread” — which looks and tastes a hell of a lot like sriracha and mayo mixed — to give the thing an indistinct back-of-the-mouth heat that never quite bites or cuts but is present throughout. Bacon is bacon, and it’s well-prepared — thin-sliced but layered thickly, crunchy but not overcooked, still oozing grease from its recesses. The provolone cheese is piled on top and I caught myself wishing at times during the first half of the sandwich that they had found a way to better distribute it throughout. By the second half, it melted onto the pork and provided a nice sharp flavor and some creaminess on the other side of the sriracha spread. The bread was soft, but it wilted in the center under the considerable grease of the ingredients on top. But I’m not sure it’s fair to fault the bread. A yellowish, translucent grease spilled out the back of the sandwich starting with the first bite and pooled up in the wax paper below, ultimately catching some thicker splashes of bright pink sriracha spread to create an ominous, psychedelic lava lamp of grease in the dish. In my head I could hear the guy at the next table again. “His doctor told him he had to stop.” But I looked at that guy and he was midway through some massive and awesome-looking sandwich. And I looked down at the remaining quarter of mine, wondering what my own doctor would say — almost certainly: “stop!” — then picked it up and polished it off. I suspect the sandwich is called the 50/50 because it’s even money it’ll kill you. Wouldn’t be the worst way to go out. What it’s worth: It cost only $8, which is a pretty great deal. It’s obvious every ingredient in there is quality, and if you had more will power than me you could probably make two meals out of it. How it rates: 77 out of 100. On taste and texture alone it’s a borderline Hall of Famer, but it’s docked points for the associated grease and guilt. This one came on rec from @BobbyBigWheel. The man can scout a sandwich. The sandwich: Chicken from Cheeky Sandwiches, 35 Orchard St. in Manhattan. 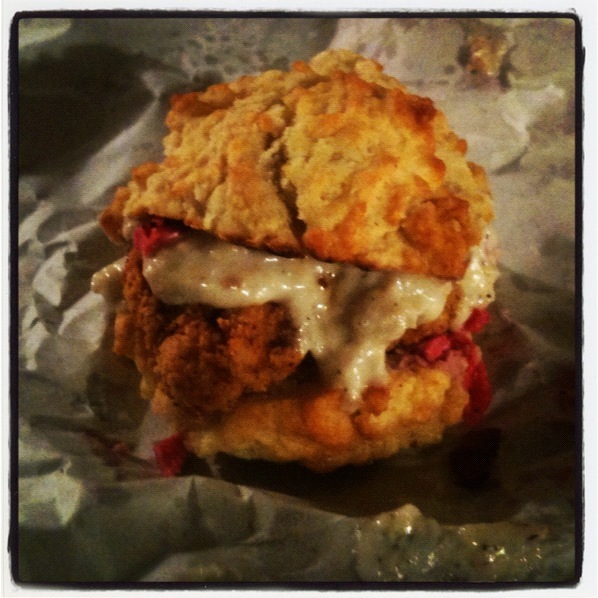 The construction: Fried chicken with red cabbage slaw and white gravy on a buttermilk biscuit. Important background information: You could walk right by Cheeky Sandwiches twice and miss it. I know because I did. Nearby, pierced scenesters spill out of a gallery full of black and white photographs that look ripped from the liner of a Tool album, smoking cigarettes and saying things like, “fresh” and “bold.” Inside, Cheeky Sandwiches is tiny, clean and unpretentious. It serves beer, soda, wine and sandwiches, and it feels like a sensible foothold upon which to steady yourself before or after venturing into the gripping Lower Manhattan strangeness beyond. How it tastes: Fresh. And bold. First, the former: It seems possible everything on the Chicken at Cheeky Sandwiches save the slaw was prepared after I ordered it. And that seems almost impossible, given how quickly the guy worked. The chicken was moist, and the breading remained crispy under the strain of the creamy gravy. And the biscuit, piping hot, was crumbly and toasty on the outside and soft on the inside, buttery with just a hint of buttermilk tartness. As for the bold: That came from the slaw, an assertive, crunchy, vinegary bite mixed in to an otherwise homey, comforting sandwich. It reminded me a bit of the red cabbage often served with German foods like sauerbraten, and indeed, at times felt like something that would fit better in a different sandwich. It’s tough: I feel like if I had this without the slaw, I’d pine for a little something extra to put the sandwich over the top. But with the slaw, I found myself wishing at times that it wasn’t distracting my palate from the biscuit, chicken and gravy. Some tastes were perfect — Hall of Fame-caliber bites. In others, the slaw was too strong. This seems like as good a time as any to remind everyone that nearly every one of these sandwich reviews comes off a pathetically small, one-sandwich sample. I suspect I could return to Cheeky Sandwiches, get this same sandwich with slightly different proportions, and deem it an inner-circle Hall of Famer. But since that hasn’t happened yet, and this is the only one of its kind I’ve sampled, this still-awesome sandwich will fall slightly short of that hallowed distinction. It didn’t help, I will add, that the biscuit could not quite withstand the elements of the sandwich and fell apart before it was finished. The biscuit is crucial to the excellence of the sandwich, though, so I’d never suggest it be replaced with another form of bread. What it’s worth: It costs $6.50. It’s not huge, but it’s certainly a small meal, and two of them would be more than a large meal. The price seems very reasonable, given the quality of the ingredients. How it rates: 88 out of 100. I eat a lot of sandwiches. You probably know this, or at least suspect it. For a variety of reasons, I do not write about nearly as many sandwiches as I eat. Sometimes I forget to take a photo. That’s one thing. I’m in a pretty good habit now of photographing most sandwiches placed in front of me, but plenty of times someone serves me something and either my phone is inaccessible, it doesn’t seem appropriate to pull it out, it’s too dark, or I’m hungry enough that I just want to eat the damn thing. For another, sometimes I just don’t have anything to say about a sandwich. Many times that doesn’t stop me and I churn out uninteresting sandwich reviews anyway, but if I’m eating something very similar to something I’ve had before, it’s a good bet I’m not going to bother repeating all the same things. I repeat myself enough as it is without forcing it. #BlameBeltran. There are also some guilt issues. This is among the reasons I can never be a proper food critic. I have no qualms about ripping a disappointing new menu item from Taco Bell or lamenting Subway’s quality of meat, but most of the sandwiches I eat come don’t come from massive corporations. And I don’t feel like it’s my place, without any real credentials beyond a few years behind a deli counter, to come online and criticize some guy’s sandwich-making skills to whatever audience I have based on my own tastes and a one-sandwich sample size. It takes so much effort to open and operate a deli or restaurant or food truck, and I’m not here to stomp all over someone’s life’s work because I’m disappointed with a single one of her sandwiches. Which is all a long-winded way of reminding you that every sandwich reviewed here is, by my standards, remarkable — in that I have deemed it worthy of remarks. And for the most part, they come from the extreme right side of the bell-curve of sandwich-excellence. I would say that sandwiches I rate in the 70s are worth eating if you have the opportunity. A sandwich with an 80 or above is delicious and worth going out of your way for. If many of the sandwiches reviewed here receive marks that high, it’s due to selection bias, not grade inflation. I don’t know why anyone would want to hear about crappy sandwiches anyway. Sandwich of the Week is a celebration. The sandwich: Pork sandwich from Rocket Pig, 24th St. and 10th Ave. in Manhattan. The construction: Brined, spice-rubbed, smoked and roasted pork on a toasted ciabatta roll with red onion jam and mustard aioli. It comes with a small container of electric orange hot sauce. Important background information: I am immediately suspicious of a pork-sandwich place called “Rocket Pig.” It seems aimed so perfectly and so directly at me that I worry it indicates either a) some sort of glitch in The Matrix or b) that there are enough people just like me that restaurants tailor their marketing efforts to us, and I’m just some drop in the ocean of my demographic. Both scenarios are concerning. How it tastes: Sweet. And gooey. You can’t stop because it’s good. You love condiments, and this comes with three. All of them are sweet. On its own, the hot sauce has just a tiny bit of peppery heat, just as the mustard aioli has a hint of mustardy bite to it and the red onion jam some subtle earthy onion flavors. Together, though, those subtleties are lost in an astonishing tide of gooey sweetness. The same goes for the pork, which is a shame. Separated from the sandwich, the pork tastes great. It’s appropriately fatty, just a little chewy, and smoky. On the sandwich — in that goo-tide — the pork flavors get sucked into the undertow. The ciabatta roll is perfect. Its crisp outside provides the sandwich’s most pronounced texture, and it’s hearty enough to hold up under the considerable strain of the sandwich’s varied juices, greases and sauces. 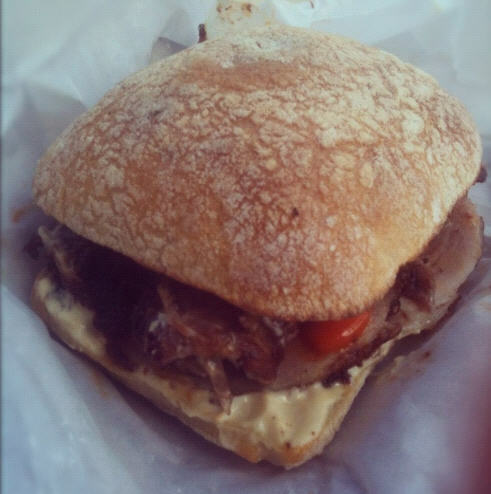 What it’s worth: The pork sandwich from Rocket Pig costs $14. It might be worth it. It might also seem emblematic of a doomed society drowning in its own excess if it weren’t for the lavender-glazed doughnuts available a block away. And you can try to fight the tide, waving your arms around and calling out in vain for help, decrying whatever series of events led us to sell and buy $14 one-note artisanal pork sandwiches, lavender doughnuts, and basically everything you can imagine stuffed with cheese. Or you can accept that regardless of the ramifications, this is a fascinating and — if you have the means to splurge on a $14 sandwich now and then — often enjoyable time to be alive, and surf this wave until it breaks. Subtlety and sensibility are for suckers, after all. How it rates: 73 out of 100. The candidate: Ultimate Taco from Fry Bread House, Phoenix, Ariz. The construction: Green chile beef and refried beans with sour cream, lettuce and cheese on folded frybread. I ordered mine without onions. Frybread is flat fried dough with a complicated place in Native American history. You should read this for way more, but essentially: In 1864, when the U.S. government forced the Navajo out of their native land and into less habitable lands in what’s now New Mexico, it provided them rations to prevent starvation. The rations included lard, flour and sugar, from which they made frybread. For the purposes of only this discussion, what matters most is that it’s delicious. Arguments for sandwich-hood: The Ultimate Taco is meat and toppings wrapped in a bread. Though the frybread is amazing, the fillings make the dominant flavor and focus. I ate it with my hands, though it got a bit messy. It was more than enough for a meal. Arguments against: There’s only one piece of bread-stuff. Plus, it’s called a taco even though it doesn’t much resemble anything else you’ve seen called a taco. How it tastes: So, so good. Amazing. I don’t really know how to present this in an appropriately sensitive manner, given the history of frybread and whatever socio-cultural implications this presents, so I’m just going to come out with it: It both resembles and tastes like a Chalupa Supreme from Taco Bell. It’s a fried piece of bread-stuff wrapped around beef, lettuce and sour cream. Only it’s much bigger and much, much better than any Chalupa I’ve ever had. My friend Will said something about it making Chalupas look like cave drawings — presumably he meant that this is the Renaissance masterpiece of taco-stuff-in-fried-dough. I wasn’t really paying attention, though. I couldn’t focus on anything but the Ultimate Taco. The frybread is hot and pillowy, with a beautiful, crispy golden brown outside and a chewy middle. The beef in green chile was perfectly seasoned, tender little bites of beefiness with just enough flavor to permeate every taste but not enough to dominate the velvety refried beans and the cooling sour cream. The lettuce added some crunch on the inside, the cheese some salty creaminess. Oh man. Man. We have to go back. I typically don’t rate sandwiches reviewed in this format, but since this one was a no-doubt Hall of Famer from the first bite, I’m adding it to the Sandwich Hall of Fame. I suppose that sort of gives the verdict away. What it’s worth: I think it cost $8 or so. Also, a flight to Phoenix and a hotel room and everything else. Worth it. The verdict: It’s a sandwich. Everything about it besides it’s name says so, and also it needs to be recognized on this site permanently and I don’t have a Taco Hall of Fame. It’s clearly toward the gyro end of the sandwich spectrum, since it’s one flattish piece of bread instead of a traditional two-slices-of-bread sandwich. But it’s a sandwich. An awesome sandwich. The sandwich: The James from City Sandwich, 9th Ave. between 45th and 46th streets in Manhattan. The construction: Roast beef with melted mozzarella, broccoli rabe, roasted peppers and olive oil on a hero. It’s supposed to come with sauteed onions, but I ordered mine without them. Important background information: It’s probably by coincidence, but I’ve been winding up in more and more sort of high-endish, European-inspired sandwich shops lately. This is not a bad thing, as they often serve good sandwiches. They mostly boast various imported and/or otherwise exotic cured meats, fancier cheeses than you usually get on a sandwich, and extremely hearty bread. The bread in many of those places, I find, often actually takes away from the sandwich. It’s delicious, fresh bread and something (like most things) I would love slathered in butter, but it’s so thick that it’s sort of a bear to eat as a sandwich and sometimes even rough on the roof of the mouth. Also, many of those places seem to think importing fancypants meats and cheeses and serving them on giant loaves of bread means they can get away with using like two thin slices of meat per sandwich, and this is America bro. 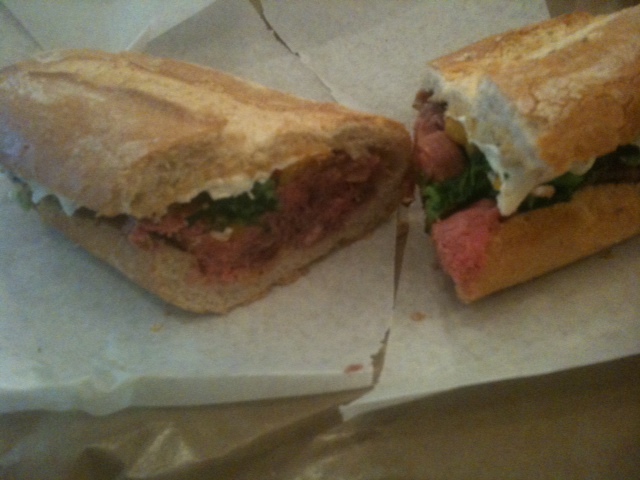 I went into City Sandwich knowing that it boasted Portuguese and Italian influences, concerned about that bread thing. But City Sandwich removes the inside from their loaves, creating a strong, crispy-crusted but not too bready platform upon which the sandwich is built. Also, it’s toasted. And in combination with the roast beef, it creates an awesome, underrated sandwich effect that I fear I haven’t spent enough time discussing here: the mix of hot and cold ingredients. The roast beef here is cool, like you’d get at a deli where it’s kept in the fridge before it’s sliced. And with the warm, toasted bun and the melted mozzarella, you’re getting not only a combination of flavors and textures but also temperatures. And it’s good. The fresh mozzarella is amazing, like most fresh mozzarella. City Sandwich does a good job with the broccoli rabe and roasted pepper, too. I think some places, when adding an uncommon ingredient like broccoli rabe, tend to go overboard with it to rub it in your face like, “hey man that’s right it’s broccoli rabe look at me look at me look at me.” But not here. It’s chopped up small and cooked tender, and there’s just enough of it to give the sandwich a little bit of its bitter flavor without making the whole thing just taste like broccoli rabe. There are a few more roasted peppers, but they’re in perfect proportion to the rest of the sandwich and add a nice sweetness. Oh, and the roast beef! It’s really good. Roast beef can be kind of a crapshoot everywhere and I’m working with a one-sandwich sample size, but the roast beef on my sandwich was sliced extremely thin and served incredibly rare — real nice and pink, and extremely tender. There was olive oil on there too. It must have done its job because at no point while eating this sandwich did I think, “this sandwich could be or should be wetter.” But because of the stronger flavors (and the way I normally associate olive oil with roasted pepper flavor, I suppose), the olive oil didn’t really stand out. More of a glue guy. What it’s worth: The James cost $8.95 plus tax, and it was huge. It probably could have been two small meals but it was good enough that I wanted to keep eating. How it rates: 88 out of 100. This sandwich lacked that extra, transcendent element to take it to the Hall of Fame level, but it’s delicious nonetheless. I will be trying other sandwiches at City Sandwich after future appointments at my doctor’s office nearby. Thanks to Mark for the tip on this one. The candidate: Mami Arepa from Arepas Cafe, 33-07 36th Ave. in Astoria. The construction: Venezuelan roast pork, shredded white cheese and avocado in an arepa. Arguments for sandwich-hood: Meat and cheese in bread-type stuff. The bread-type stuff is on both sides of the meat and cheese, and it’s clearly made to be eaten with the hands. Though it’s called an arepa, the focus is obviously on the stuff inside over the stuff outside. Arguments against: It’s called an arepa, not a sandwich. Ho hum. There’s only one bread-thing (the arepa), it is made from cornmeal, and it’s sort of a pancake/muffin hybrid, and not very bready. How it tastes: Unsauced, it was good. The wedge of the arepa made proper ingredient distribution difficult, so the first few bites were mostly cheese and avocado and the last few were almost entirely pork. None of those ingredients stood out, but they were all tasty: The pork lightly seasoned and pleasantly chewy, the cheese salty and creamy, the avocado smooth and, well, also creamy. Before the waiter brought the arepas, though, he put two sauces on the table: A green sauce and an orange sauce. The green sauce tasted garlicky and a little like my prized pio pio stuff, though a touch heavier on the mayo and lighter on the spice. The orange sauce had a jelly-like consistency, with some sweetness and a ton of heat. In conjunction and carefully applied to the arepa, they made the thing delicious — not just because the sauces tasted good, but because they amplified the stuff inside. I never really understand how this works, but somehow with a little bit of spice, pork tastes porkier, cheese cheesier, everything. There’s probably a life lesson in there but it’s Friday at 5 p.m.
For a few bites, when the sauce is working and all I’m taking down all three ingredients, this is borderline hall-of-fame level stuff. The arepa itself is a perfect vehicle for the melange of flavors inside, too: It’s griddled to crispiness on the outside and holds up under saucy duress giving it almost a panini-like effect, but then it’s got a thin, mealy, soft inside like a johnnycake. But due to the aforementioned uneven distribution that seems intrinsic to this medium, those bites were fleeting. The rest was still really good though. What it’s worth: If I recall correctly, around seven bucks. And it’s definitely a meal, though not a huge one. The verdict: A sandwich. If a gyro’s a sandwich this one’s a no-doubter.